Husband-to-be Charlie Vo said he saw the photo on Instagram and was surprised to learn that "the world is looking for us"
Talk about being at the right place and the right time. Matthew Dippel was hiking in Yosemite National Park on Oct. 6 when he asked a friend to stand on Taft Point so he could snap a photo of him. While waiting for his friend to reach the popular overlook, Dippel noticed a couple in the distance stepping out on to the rock’s edge. When the man got down on his knees, Dippel realized he was witnessing a proposal from afar and the Michigan-based photographer snapped a photo of the stranger popping the question to his girlfriend. Dippel didn’t know who the couple was and wanted them to have the photo. He posted the stunning image on social media and asked the internet to help him track them down. The picture went viral and two weeks later Dippel had found them. Husband-to-be Charlie Vo said he saw the photo on Instagram and was surprised to learn that "the world is looking for us." After verifying with his fiancée, Melissa Ngo, that the photo was actually of the two of them, he reached out to Dippel. "I saw my dress — I had to zoom in a little bit — but as soon as I did, I was like 'Oh my gosh, that's me," Ngo said. Dippel had actually photographed the couple's second proposal. Vo asked for Ngo to marry him back in February because they wanted to make sure an ailing grandmother knew a wedding was on the way. Vo, from Alhambra, said the couple loves traveling and the outdoors, so when they planned a trip to the California national park he knew he wanted to do something more "meaningful" and private since the first one included family. 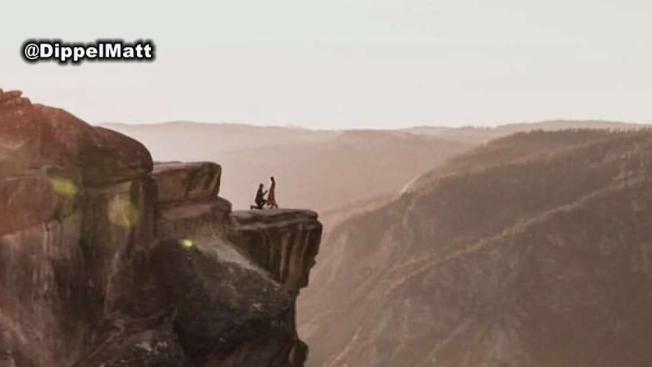 Some of the couple's friends also snapped photos of the proposal from afar, but none compare to Dippel's stunning picture of a silhouette of man on one knee holding a woman's extended hand while standing on top of the scenic cliff. Vo told NBC News he had actually given Ngo a Ring Pop in the proposal captured by Dippel since his fiancée already had a ring. The two met in college and began dating about two years ago, according to NBC. They plan on tying the knot in April of next year.